Sawyer Beef is local grown Black Angus beef from Princeton, Iowa. A family farm that is 5 generations strong raising some of the best beef this side of the Mississippi! 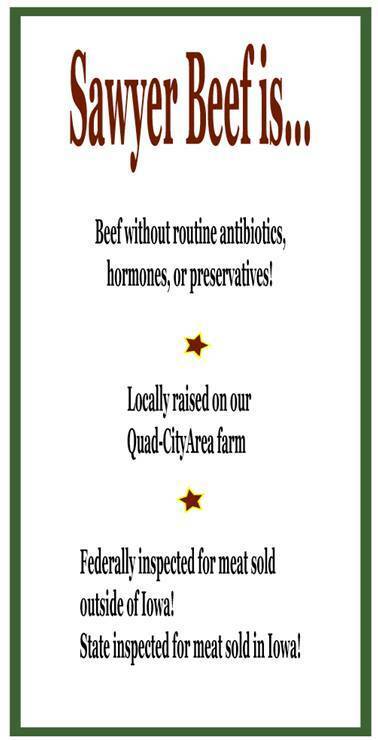 We have all retail cuts and sides of beef available for purchase at the farm, several farmer’s markets and grocery retail locations around the Quad City area. We now have ¼ Beef Bundles available. Click here to learn more about the Beef Bundles.